Whether or not spring has sprung in your neck of the woods, we are hopeful that it will soon look and feel like what the calendar reflects: springtime! Springtime brings about milder temps, shooting buds, and the pressure to clean your home after a long winter of being cooped up for months on end. Have you ever wondered where spring cleaning came from in the first place? Well, it’s debatable but according to Wikipedia, “Some researchers trace the origin of spring cleaning to the Iranian Nowruz, the Persian new year, which falls on the first day of spring. Iranians continue the practice of khooneh tekouni (literally ‘shaking the house’) just before the Persian new year. Everything in the house is thoroughly cleaned, from the drapes to the furniture. 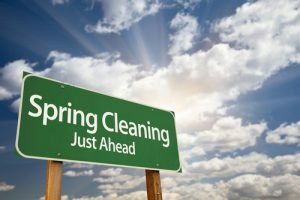 Another possibility has been suggested that the origins of spring cleaning date back to the ancient Jewish practice of thoroughly cleansing the home in anticipation of the springtime festival of Passover (Pesach). In remembrance of the Israelites’ hasty flight from Egypt following their captivity there, during the week-long observance of the Passover holiday, there are strict prohibitions against eating or drinking anything which may have been leavened or fermented with yeast. Jews are not only supposed to refrain from leavened foodstuffs (chametz), they are expressly commanded to rid their homes of even small remnants of chametz for the length of the holiday. Therefore, observant Jews conduct a thorough “spring cleaning” of the house, followed by a traditional hunt for chametz crumbs (bedikat chametz) by candlelight on the evening before the holiday begins. Traditionally, the Catholic church thoroughly cleans the church altar and everything associated with it on Maundy Thursday, the day before Good Friday, in the Spring. Spring cleaning persists today in Greece, and other Orthodox nations. It is traditional to clean the house thoroughly either right before or during the first week of Great Lent, which is referred to as Clean Week. This also often corresponds with the Julian New Year, or April 1st. In honor of this long-overdue calendar event, we are offering our loyal customers great savings to show our appreciation for shopping with us, CleanItSupply.com, your online warehouse superstore. Save up to 57% OFF our most popular spring cleaning products! With our huge selection, fast shipping, and wholesale prices, you can’t go wrong, unless you miss this sale. Go ahead and celebrate the milder-weather spring season with anything-but-mild savings in your cart! Your 57% OFF savings start NOW! This entry was posted in Professional Cleaning and tagged Cleaning Supplies, floor and carpet care, mops brooms brushes and dusters. Bookmark the permalink. Is Your Business “Techie” Enough?